Zero-X, a manned exploration mission crashes during lift-off on its maiden flight. Two years later an investigative committee finally concludes sabotage, and decides to call on the services of International Rescue to oversee security at the impending second launch. The second Zero-X successfully reaches its destination, but encounters unexpected hazards, ultimately leading to another call for assistance on its return to Earth. 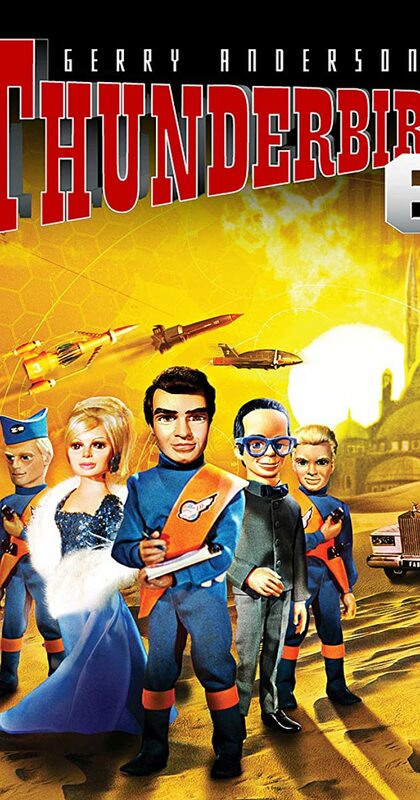 International Rescue respond, and once again Thunderbirds are GO! Sometime in the late twenty-first century, the space craft Zero-X is embarking on a manned mission to Mars, the first mission of its kind. Almost immediately after launching, Zero-X faces technical difficulties, forcing its crew to abort the mission and eject from the craft before it crashes back down to Earth into the sea. Two years later, a redesigned and reconstructed Zero-X is ready for a second manned attempt to reach Mars, which coincides with the Space Exploration Center's finding that the first mission was sabotaged. As such, they recruit the Thunderbirds - ex-astronaut Jeff Tracy and his four sons Scott Tracy, Virgil Tracy, Alan Tracy and Gordon Tracy, each in his own Thunderbird air craft - to oversee security. By their side in the Fab1 mobile center on Earth is the beautiful Lady Penelope Creighton-Ward. The Thunderbirds not only have to prevent possible sabotage a second time around, but also deal with any other possible technical difficulties that may arise that requires on hands support. Through the Thunderbirds' mission, Alan begins to feel under-appreciated in his role, which culminates with a life and death task for both himself and the crew of Zero-X. The "Thunderbirds" TV-series always had been a very entertaining one to watch, which is also the reason why reruns of it still air, decades after the series had ended. I myself also always had been quite fond of it, which made it all the more a personal disappointing that this movie just doesn't live up the TV-series. Really the biggest problem with this movie is that it just never feels like you are watching a big, 90 minutes long, Thunderbirds adventure. Instead this really feels like a TV-series episode, that however got incredibly stretched out, which for the movie means that it has such a slow build up and some of the scenes seem to go on for however, while they add nothing at all. It really makes this a boring watch. But even the story itself is really below par. If this story got used for one of the random TV-series episodes it would had been one of the lesser ones at well. It's simply lacking in some fundamental ingredients, such as a villain or even a clear main plot line. Seriously, when the movie is about at its half way point, you will still have no idea what the main story is supposed to be about. It's just all over the place! Also the dialog is real poor but this is something that seems to suit the Thunderbirds type of charm and atmosphere. Main reason why I always liked watching the "Thunderbirds" was because they had an old James Bond type of charm and atmosphere to it. I am of course talking about the very first Bond movies, starring Sean Connery. The clothing, the sets, the villains, the silly gadgets, spy plots and of course the fact that both were made during the '60's make James Bond and "Thunderbirds" much alike. All of this is also still present in this movie but it just all works out far less entertaining and interesting this time around. Another reason why the series was so popular was the combination of its science-fiction and action elements. The only science-fiction this time comes from the space mission that is set to Mars but the Thunderbirds themselves are not even involved with this. None of the Thunderbirds' crafts even gets to do anything in this movie and they are also hardly in this at all. There is also hardly any action, though by the end you will still get treated with some trademark big Thunderbirds explosions. I can't imaging that someone will get into "Thunerbirds" after watching this movie and also will understand why it was such a popular show. It is possible to watch this movie without knowing any of the background of the characters or stories from the TV-series but still the movie does a very bad job at setting up the characters and story for any new, fresh viewers. Some of the familiar characters make even a totally redundant impression. Was there any reason for all of the Tracy brothers to be in this? And couldn't Lady Penelope and Brains just have been let out as well, since they add absolutely nothing to the story, once you start thinking about it. When looking purely at this movie, all of the characters are such extreme boring and one dimensional ones, as wooden as its facial expressions. They also didn't do any new tricks, so still expect all of the same and familiar puppetry tricks and effects, like got used in the television series. This is all still something good and impressing of course. "Thunderbirds" made puppetry something awesome and all of the miniature sets and set pieces are still a joy to look at, as is all of the marionette work that is in it. I really expected to- and also tried desperately to like this movie. I tried to let them get away with some stuff, courtesy of its style and charm but they basically however did everything wrong. It's just a boring and very uninteresting, unimaginative, redundant Thunderbirds 'adventure', I am sad to say. http://bobafett1138.blogspot.com/ I remember back in the 1960s the family were out for a walk and we were passing a cinema. We had nothing else to do, so we went in to see this. I had never been particularly impressed with the TV version in black and white (at that time in Britain). But I was very impressed with the film. In full glorious colour, and the special effects looked highly realistic on the big screen - they really did. It's kids' entertainment for children aged from 7 to 700. The fact it lasted longer than a TV episode doesn't matter. You get a great exciting story, lots of journeys into space in a blistering adventure that'll steam up Brains's glasses and set his bow tie spinning. Saw the film again recently, this time with the eyes of an adult. Saw the dream sequence set in the night club. I was amazed at the attention to detail with The Shadows. Not only was each puppet almost a perfect model of Hank, Bruce, John and Brian, but the little Burns guitars were perfect in every detail, right down to the trade mark scroll head. Beautifully done. The singer was Cliff Richard Junior. Oh, well, you can't get everything right!